I have presented two works in the ROBOT 2017 conference that has taken place in Seville (Spain) the November 22-24, 2017. The first work was performed by a BSc student under my supervision. In this work, we present two original game theoretic algorithms for task allocation in multi-robot systems. The first algorithm is competitive, defines games between each robot and its neighbors for the closest tasks, and searches the best Nash equilibrium. The second algorithm is cooperative, establishes a voting system in which the robots can vote their preferences to perform every task, and searches a task allocation with social welfare. The test in a simplified scenario show that both algorithms work under limited communications and partial information, but the competitive one generates better allocations than the cooperative one. The second work was performed by two students and I just gave them advice about technologies and algorithms. This work explores the 3D reconstruction of real scenarios and their integration in virtual reality interfaces. Two sensors are used for 3D reconstructions: laser scanners and RGBD cameras. Several algorithms are applied to convert the raw pointclouds into useful meshes. The resultant 3D maps are visualized in virtual reality by means of a head-mounted display. During the last months I have attended to the Technology Marketing Course organized by the UPM_innovatech program, where I have learnt about technology marketing, sales, negotiation, economic valuation... Additionally, I have taken part in the UPM_innovatech 2T Challenge with GreenBot, a team of robots that run through the greenhouses ensuring that the environmental conditions are appropriate for the crops, reaching the final of the contest. 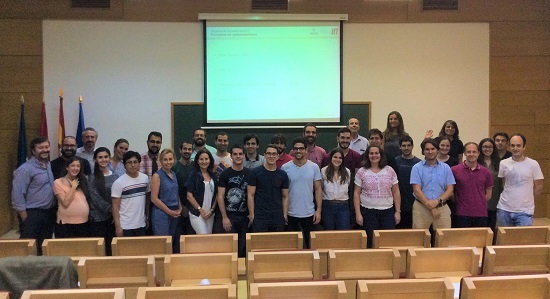 Durante los últimos meses he asistido al Curso de Comercialización de Tecnologías organizado por el programa UPM_innovatech, donde he aprendido sobre marketing tecnológico, ventas, negociación, valoración económica... Además, he participado en la competición UPM_innovatech 2T Challenge con mi idea GreenBot, un equipo de robots que recorren los invernaderos asegurando que las condiciones son óptimas para los cultivos, alcanzando la final del concurso.